LOCAL: If you buy from one of the many friendly local game stores on our pre-order list, you won’t have to pay shipping fees, as you can just pick up the expansion from the store in early April. ONLINE: If you pre-order from an online store, you can consolidate your Moor Visitors pre-order with other games–everything will be shipped from that retailer to you in mid-April (so by default, the shipping is region-friendly). Many of these stores ship throughout Europe. Awesome – would be cool if there was an expansion in Agricola with a nod to viticulture and have some vines harvesting, even if it was just a special edition where the crop type got changed. Also i notice your UK local store list is pretty small, how would my FLGS get onto this? Chris: Thanks, I’ve contacted Funagain so they can make their link go live. As for those game shops, if you’d like them to participate, I’d recommend that you reach out to them and put them in touch with me (stonemaiergames@gmail.com). Chris: That would be really cool. :) As for UK local list, we invited a ton of retailers, but these are the retailers that chose to participate. If you want a specific local retailer to participate, you can share with them what we’re doing here and ask them to contact me at stonemaiergames@gmail.com. Kosongz: I contacted several, but they didn’t reply. If you want them to participate, I recommend that you contact them. Hello Jamey! I’m so excited about this! We are 3 games in of viticulture with my gaming group, next winner will pick the first expansion of tuscany to play with (can’t wait for this to happen!). 1) Can we mix up this cards with the standard viticulture game right away? I think more cards would add so much more diversity since we always play 6 player games. 2) In your list there is no retailer for Italy, I called my 2 local stores and none of them knows about this (I know it’s insane). So do I really need to buy it from spain or there is any way to buy it directly from you? Thanks Gonzalo! Yes, you can mix the cards into any version of Viticulture right away. You can’t pre-order directly from us, but I’d love to add an Italian retailer to this list. I contacted 4 of them and none responded. Jokes aside, I will wait for a couple of days to see if it pops up on my fav sites. I sent a facebook message to one already. If no one adds it, then I will buy it from you. BTW: what happened to the plans for a localized version of V./T. for the german market? Please excuse, if I did miss lines about in your newsletter. Hartmut: That’s a good question. Feuerland will be releasing a German version of Viticulture Essential in March/April (and Moor Visitors at some point–I’m not sure if it’s on the same schedule as Viticulture). I wish either Poromagia or lautapelit.fi decided to start distributing Stonemaier Games products in Finland. I guess the market is small but still, one can always hope (and send messages to both companies). Fantasiapelit has some SM games but availability is bad. They will only order from supplier if needed and they add at least 10-20% premium on top of RRP for board games. Euphoria for example is a sweet 84 euros (without shipping) through them. That’s why I prefer the other two companies. On that note, Board Game Extras seem to have pretty low shipping for Moor Visitors throughout Europe. Toni: I’d love to work with those companies as well. Are they retailers (they sell to people like you) or distributors (they sell to retailers)? They are all retailers for board games (ie. I buy most of my games from them) but especially Lautapelit.fi is doing other board gaming related things as well like publishing (Eclipse, M.U.L.E., etc.) and localization. So they are all about board games while Fantasiapelit and Poromagia sell a lot of non-board gaming related stuff as well. But all three are mainly retailers as far as I know. Is there anyway we can bundle this with a Scythe? For those that are backers of that game? No, Scythe won’t be released until this summer, but Moor Visitors will be released in a few weeks. Also, you bought Scythe from us, but this pre-order is through retailers–two completely different systems. Hello! The box seems pretty big for a pack of 40 small cards. Is there some sort of surprise in there that you haven’t told us about just yet? Thanks! Nope, no surprise. :) It’s not a big box–the photo probably makes it look bigger than it really is. Thank goodness for online retailers, I’m surprised that Cool Stuff Inc wasn’t in the listing for Florida. Ordered from Cardhaus! Jamey, have to compliment the understated way in which you do and announce things. Clearly this took a not insignificant amount of work and coordination. Nevertheless, not only did you keep it a secret but when you finally announced it you did so in a “So, here’s something neat” conversational kind of way. Not quite sure why that works so well for me but it does, and I’m guessing it does for other people too. Way to go doing great things and not needing to excessively toot your own horn about them. It’s a great way to be and to do business. Gabe: Thanks! I appreciate that feedback about the way I presented the product. I’ve learned a lot by reading newsletters by Michael Mindes at TMG and Isaac Childress at Cephalofair. Are the copies being sold by European online vendors in English? Wouldn’t be a problem to order from Miniature Market if not, shipping would just take longer. Patrick: Yes, all copies are in English. Will the Treasure Chests be pre-ordered this way? Glad to see Miniature Market on the list. The upcoming Token Trilogy will be done as a pre-order, but it requires a lot of up-front funding, so we’ll be running a direct pre-order for it. I’m excited to get my hands on this, but not in a big hurry. Is this limited in any way, or is there any advantage to preordering? Is it realistic to expect to be able to buy it at GenCon? Jamey: No one in California will carry this expansion? Not even Impressions? Jerry: I would love for a California retailer to be a part of this pre-order, but none chose to sign up yet. Feel free to contact your local store to let them know about it! Jamey, I am a California retailer who wants to carry it but how do I do that? Barry: Can you e-mail me at stonemaiergames@gmail.com? We’d love to have you! Awesome stuff! Was a delight to back the project on kickstarter, my dad still uses the glasses all the damn time, and the game’s great to play too. Happy to get some fresh cards and look forward to mixing them in! Hello, i am from Chile. I own Viticulture and Tuscany (also Euphoria and BTC). I would love to have this expansion since i love agricola and love viticulture. Yet the market here is small i don’t think retail stores would care about getting it. What are my possibilities? Antonia: That’s a good question. As you can see, there aren’t any stores in Chile or South America that have joined this pre-order. My suggestion would be to try a few of the online stores in the US to see if they’ll ship down there. If that doesn’t work out, we will accept regular orders in April if we have any remaining copies, so we would be able to ship a copy to you then. What is the release date for the Moor Visitors Expansion? Justin: Retailers will receive it by April 8. I pre-ordered it from CSI will it be available on the same date? I noticed on BGG you said that the cards will be shipped out next week after arriving this week to St. Louis – does that mean the retailers could make it available prior to April 8? They’ll be shipped out to a fulfillment company that will then send the orders to retailers. Whenever retailers receive their games (which could be a few days before April 8), they will ship them to the people who pre-ordered from them. Do you need your copy by a certain date? No – I have a number of items in my order (its a big order with several games) and the order will not be shipped until Moor arrives. I was hoping to get the whole order sooner than April 8. Just contacted a local store and was told the initial pre-order was already filled up. What a TERRIBLE distribution model. For as wonderfully as things are normally done by Stonemaier games this is a rare fail imo. Unless there as a miscommunication and they meant the preorder window was closed… but they mentioned they had already ordered the maximum amount they could. Patrick: Yes, it’s a miscommunication. There was no maximum for any of the pre-orders. Just like any other product you would order from a local store, they will soon be able to order copies from distributors to serve you. You just missed out on the pre-order window (which ended weeks ago–it was your responsibility to order during that time)–it’s the same thing as if you missed out on a Kickstarter. I think you have a pretty big misunderstanding of how this system works, and I’m disappointed that you passed judgment on your local store and Stonemaier based on that lack of understanding. Your response is a bit harsh considering I said things are normally wonderfully handled by you and your company. And I did specify that it could have been a miscommunication. It’s not like I said any blanket negative statements. And I was merely commenting on information presented to me. No dates were mentioned in my communication with the store or on the email I was going off of. It makes sense that there was a cutoff. I just didn’t know when it was. That being said if it hits normal distribution (which I did not know one way or the other if it would) I can get if from my normal FLGS. You don’t consider, “What a TERRIBLE distribution model.” to be a blanket negative statement? Considering this is the first time you have used a model like this? No. I don’t. A blanket negative statement is “This company makes terrible games”. The only blanket statements I made were positive ones. To my knowledge for new games and expansions and even 2nd editions previous to this have all used Kickstarter. So now I don’t view that as a blanket statement. It was about this model used for this thing. And that was only being said given the strange information given to me by one of my FLGS (limited quantity of pre-order, implied but uncertain second wave of items, not flat out told i missed the window(which upon re-reading the email I do see a date range now. That was my fault)). Given the updated knowledge I now have at my fingertips I would merely say that I don’t like this method because it’s not available directly from you (through KS or your website) and my preferred FLGS can’t order it from distribution at the same time other stores (including online stores (which in my opinion hurt the industry more than help it… but that’s a discussion for another day)) can get it. It’s a logistics problem for that store but in most cases if he can’t order from a distributor he can’t get the game. It seems that there are many problems with the Moor Visitors Expansion. My shop (Board Game Extras) told me, that they could not send me my prepaid copy, because you are not able to send them the games. March is already nearly over now. Is there a possibility to get this cards in the next few weeks. It would be very helpful if you don’t fix dates that are not realistic. 1. “You are not able to send them the games.” The truth is that the games are on their way to the retailer. They are currently at customs in France. Your retailer will have them in about a week. 2. “March is nearly over now.” That is correct. The dates on this page indicate that delivery will happen in April. 3. “It would be very helpful if you don’t fix dates that are not realistic.” The original date for delivery was mid-March, which at the time was accurate. But then the freight shipment was delayed by 10 days, and then I learned that the warehouse receiving our games would not be able to send the games to retailers in a timely manner. So we had those games sent to fulfillment centers to then be sent to retailers, a process that added some time. I’m sorry for the delay, but a delay from mid-March to early April really isn’t that bad, is it? I normally add an extra month or two to my delivery estimates, but that’s usually because pre-orders happen before production even begins. In this case the games were already on the ocean on the way to St. Louis. I had no indication at the time that there were going to be any delays. 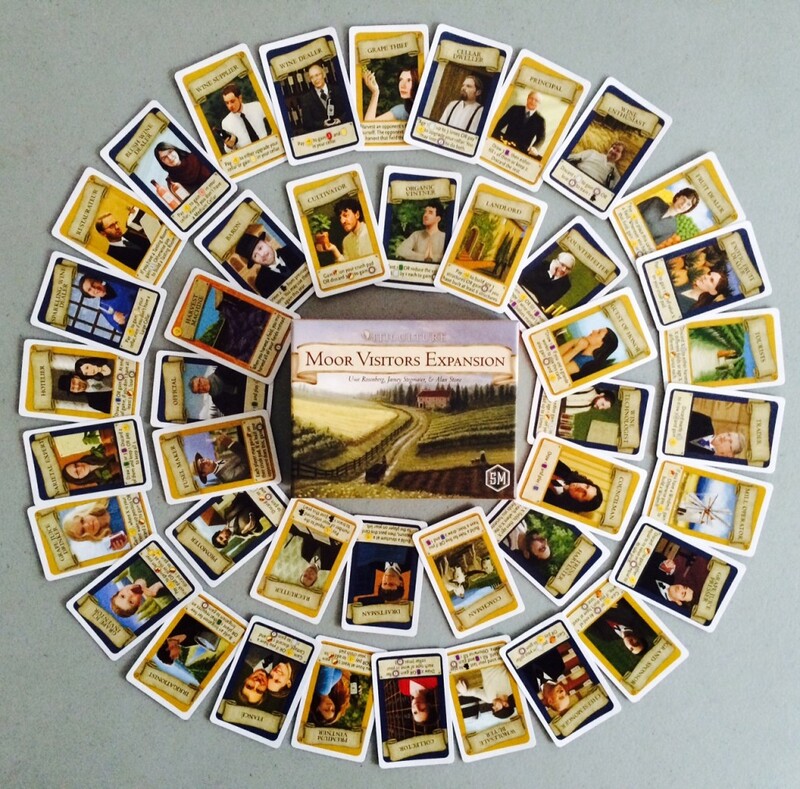 My Moor Visitors have arrived today and I am very happy that the cards fit perfectly in size and color with my Complete Collector’s Edition of Viticulture an Tuscany – after all this frightening last comments. So I still love the best game of the world as before. Thank You very much. I just received my copy of Moor Visitors. One thing that I find strange: the replacement promoter has the same image as the original, but no sponsor name. Image yes, but look at the text!!! This was a vanity pledge. A Kickstarter backer paid to have their name and likeness on the card. And the name is not there on the latest version. Klaus: The vanity pledge was for the first edition of Viticulture. This is the Moor Visitors expansion, a completely different thing. If the backer who paid $59 over three years ago whose name has appeared on 15,000+ cards feels differently, he’s welcome to talk to me about it. Any news on the return of the Australian shipment? I heard there were problems, but wouldn’t mind a new ‘rough estimate’ on arrival time. Dassie: Yes, I’m sorry it’s taking so long. It was sent to Australia but rejected by customs due to a typo. It arrived at Good Games early last week, and then should send it to retailers tomorrow. Hi Jamey, I just got my copy of the expansion, and had a question about 2 of the summer visitor cards, Grand Sponsor and Hotelier. How is the ‘at end of game’ bit played, if the card was played and in the discard pile? Does it only apply if you haven’t played it and it’s still in your hand at the end of the game? Or do you hold onto it after playing it? Thanks! Buffy: Thanks for your question. For those particular cards, you don’t discard them after playing them. Just keep them near your vineyard mat (they don’t count towards your hand size). Hello, I had received the Moor Visitor cards a while ago (too late for my birthday but close enough), and I just want one clarification. I only have the Viticulture Essential and pre-ordered the Tuscany Essential. I just watched Sweethearts or Rivals play through of the Viticulture/ Original Tuscany where the Harvest Machine card was played. There’s a Harvest Machine card in the Moors expansion. Is there one in the Tuscany Essential edition and does this card replace that or there isn’t one in the Tuscany EE? it’s only one card but I just wanted to make sure. Lillian: Indeed, that card replaces the Harvest Machine card in the original Tuscany. We fixed it in Tuscany Essential. I believe you answered my questions but I wanted to confirm. I have Viticulture Essential Edition and pre-ordered Tuscany Essential version as well (very excited to receive it!!). 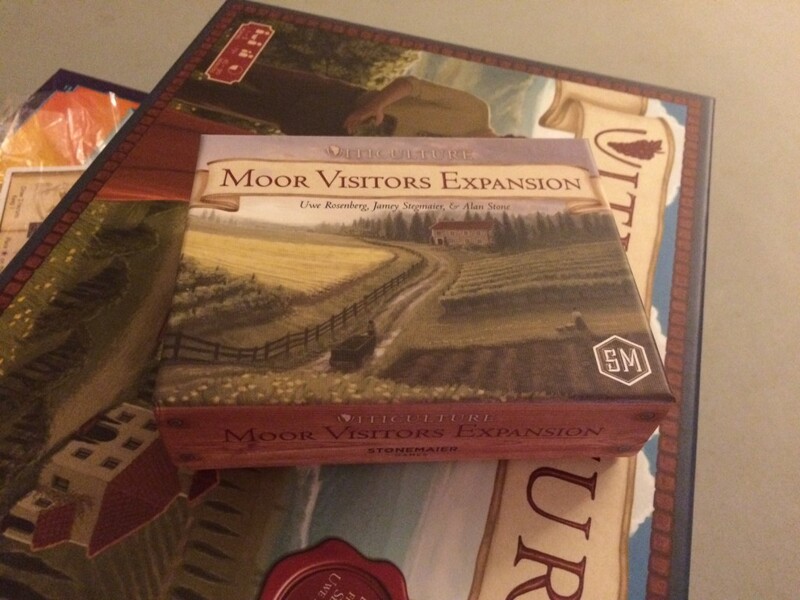 I also purchased the Moor Visitors Expansion too. Given my situation I assume I will simply remove/discard the Producer and Harvest Machine cards from this Moor Visitors expansion deck since my Producer (in Viticulture Essential) and my Harvest Machine (in Tuscany Essential) have already been corrected. Is this correct or do I simply now have two possible Producers and Harvest Machine cards in my Essential editions? Thanks for your help! Jim: Yes, that’s exactly correct. Those two cards are superfluous for you. Jamey: Thanks for the quick reply and confirmation! I will remove those two MV expansion cards since they are already correct in my editions. Viticulture is one of my wife and my favorite games, so thank you for all your hard work! I have Tuscany Essential Edition on preorder and I was wondering when you expect to reprint the Moor Visitors Expansion? Do you expect it to be before or after the Tuscany EE, as I would like to add it to my preorder at CSI if possible. Nick: I’m glad to hear you and your wife enjoy Viticulture! We’re actually almost finished reprinting Moor Visitors right now, and it should arrive at retailers in early October. It’s a little ahead of Tuscany EE, but you should be able to add it to your order without delaying it by much. I odrer Viticulture Essential Edition and I preorder Tuscany Essential Edition. So the cards from Moor Visitors are replaced with the cards from Essential Editions? Or the cards from Moor Visitors coud be add to the game without any problem? 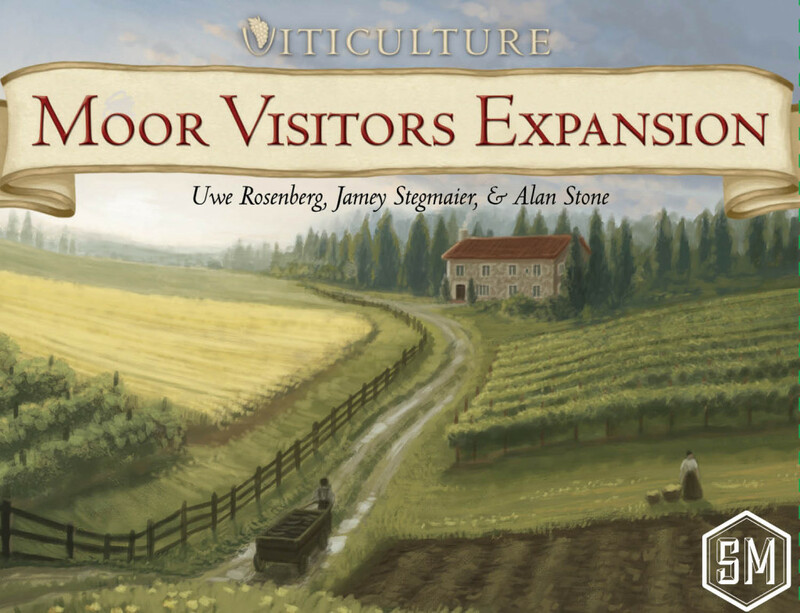 Angelo: As stated in the description at the very top of the page, “The Moor Visitors Expansion adds 40 new visitors to any version of Viticulture.” They’re completely new (they do not replace anything)–you just shuffle them right into the the other decks of visitor cards in Viticulture. Morgan: Thanks for your note–I think those stores are a little confused, as they were informed of the reprint over a month ago. They can restock at any time, as we have them in our warehouse in St. Louis right now. You did the right thing–you told those stores you wanted it. If you tell me the stores you contacted, I can reach out to them. Really!!! OMG Yes! I reached out to a few stores, but the one I want to purchase from is Vault Games in Brisbane, as they were really helpful over the holidays. Thanks so much. And Happy New Year. Morgan, did you end up getting a copy from Vault Games. I have placed a backorder with them for Moor Visitors but they claim it to be unavailable from the supplier. Jamey, i realize it’s a month and a half on from your reply that you had stock available in St Louis, is this still the case or have i missed the “wine order”. Daniel: Thanks for letting me know. We do still have Moor Visitors in stock–stores should be able to order it. I’ll get in touch with Vault Games. Lol yeah, they said the same thing to me. Looks like most of the stores in Australia source from a handful of suppliers, but of course that won’t let me know who, and it’s the suppliers who say they don’t have an order. Would it be possible to have a pdf file with the image of the Moor Visitors (exactly like the pdf file for the Essential Edition visitors) for the purpose of translating the cards in other languages? Thanks for asking, but we don’t offer that. My friend told me that the shop “Thailand (Hua Hin): Baan Boardgames Cafe” is no longer operate. Hi Jamey! My boyfriend and I are playing Tuscany expansion with Moor Visitors and need clarification on the Restaurateur card. What type (red, white, blush, sparkling) and age level of wine can you gain? Sarah: The Restauranteur lets you gain a wine token of value 1 (so, you’re limited to white or red wine). That’s what we were thinking but we weren’t quite sure. Thanks so much for the super fast response!! Love this game (as well as Scythe)! Great job! Any chance of getting this in french?